Using LORD® structural adhesives to bond truck bodies during manufacturing, rather than welding or fastening, can reduce labor costs and cycle time. 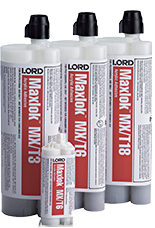 In addition LORD adhesives increase throughput, reduce material costs and weight and improve strength. What makes us different is our exceptional technical support dedicated to ensure your every design need is met. Our adhesives bond to various substrates including coated, painted, bare metal substrates, plastics and composites. We offer multiple cure speeds to fit your application requirements. We also offer glass beads for bondline control to prevent over-clamping. We provide a unique set of metal bonding adhesives for service trucks which can cross bond to plastics. Our structural bonding adhesives feature high elongation to accommodate the thermal expansion challenges of incorporating plastics into your designs. We have a full line of plastic bonding adhesives to accommodate you. Smooth sidewalls are quickly becoming the standard expected by all customers in the work truck industry. Whether you are offering a smooth-sided wall for the first time or looking to reduce production costs required by other bonding methods, LORD Corporation has the perfect structural bonding solutions for you. 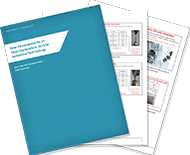 Door closures can be one of the most challenging features for manufacturing quality and aesthetics. Luckily, we have the proficiency to help reduce or replace welding frames thus creating a more cost effective and aesthetically pleasing final product. 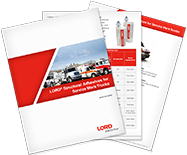 Discover the benefits of choosing LORD adhesives for your service truck manufacturing needs. Good welders are hard to find and even harder to keep – a challenge faced by manufacturers. Eliminate welds and rivets in your vehicle designs with LORD truck and trailer adhesives created to bond metals commonly used in the transportation industry. Our adhesives provide protection against galvanic corrosion from dissimilar metals. Since the first development of composite panels for sidewalls, LORD Corporation has been there developing structural bonding solutions for the transportation industry and gaining application expertise. Our truck and trailer adhesives can join the panels without unsightly mechanical fasteners and rivets. Adhesives designed for the service work truck industry to bond metal can reduce uneven stress distribution caused by mechanical fasteners and eliminate the scarring from welding with no loss of temper. Let LORD help you to reduce or eliminate rivets and mechanical fasteners, or replace welding. Improper bonding and sealing of a roof can be one of the most costly warranty items for any manufacturer. Whether you are looking for assistance engineering a solution to replace mechanical fasteners or a faster adhesive to drop into your existing production process, LORD provides structural bonding adhesives designed to seal it right the first time. You get what you pay for. Many companies offer seam sealing options, but trust LORD Corporation to offer you a unique solution to your manufacturing needs. The value of low cost product does not exist if the warranty costs of leaks eat away at your profit. Allow us to show you solutions for your seam sealing needs with our long lasting product. Designing high-efficiency HVAC units and attaching them to your service vehicle can be a challenge. 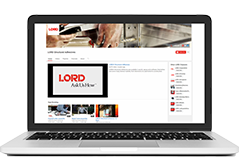 LORD offers a unique line of thermally conductive adhesives that aid in your customers’ demands for higher efficiency. Designed to transfer heat through the bonded joints, LORD 8000-series are your answer to cold.